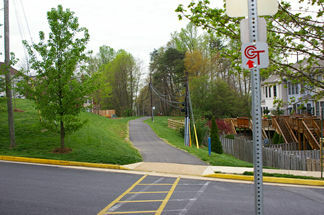 The Fairfax Cross County Trail is the result of an effort by volunteers and Fairfax County to create a single trail connecting the entire county from one end to the other. 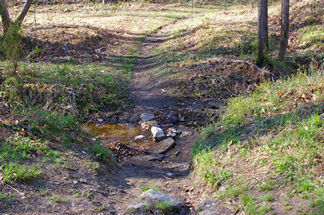 It utilizes existing trails along stream valleys with some connections along roads between valleys. Since it ties together different trails and differing terrain users will find that certain sections will not be appropriate for some uses. Also, a number of future improvements are planned but budget constraints limit the number of improvements that can be implemented in one year. This site will try to describe each section of the trail with maps and pictures so that you may select an appropriate area for your use. Fairfax County is to be commended for this effort to provide recreational oppotunities such as this for its citizens. This was the first form of CCT marker and will still be found in many locations. This is a current CCT marker. This marker is located 36 miles south of the start of the CCT. This type of CCT marker will be found along streets. 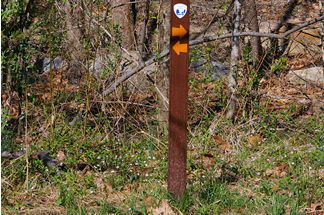 This is a Fairfax County Park trail marker. 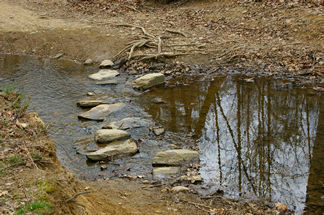 This indicates the presence of another trail and is not used for the CCT. 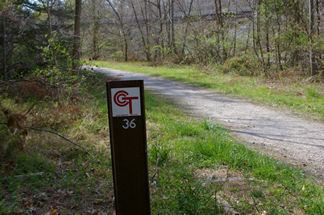 This marker may be found on the same trail as the CCT but is not used to direct travelers wishing to follow the CCT. 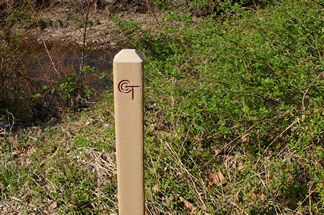 This marker may be found on the CCT between Fairfax City and the Beltway. It is not used to direct travelers wishing to follow the CCT. This marker is used along the Rails to River Trail. 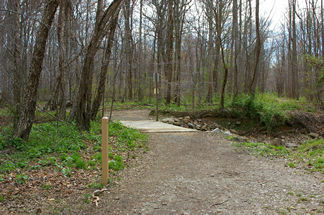 It utilizes some of the same sections of trail between Colvin Run and Georgetown Pike. 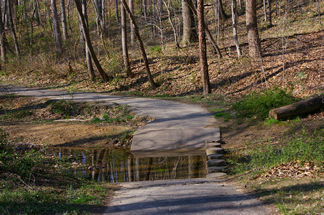 The CCT trail splits off from the Rails to River Trail in several sections where that trail becomes very muddy. 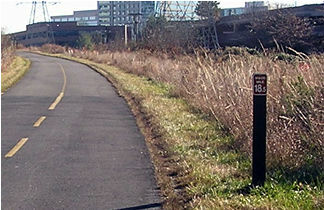 This marker is used to designate certain walking routes within Reston. It is not used to direct travelers wishing to follow the CCT. 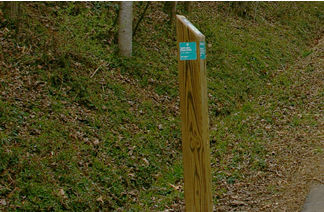 This marker is used to designate the Washington and Old Dominion (W&OD) Trail. 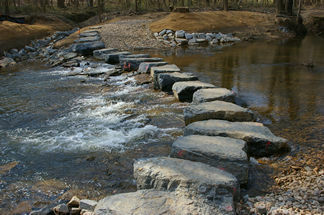 The CCT utilizes a portion of the W&OD horse trail between Tamarack Park and the Reston Twin Branches Trail. The marker is shown along the paved bike trail. 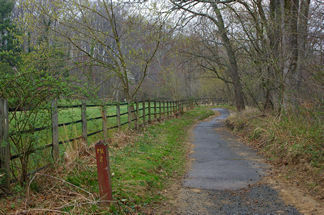 The horse trail parallels the bike trail. 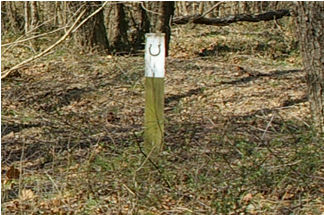 CCT markers are located along the horse trail. 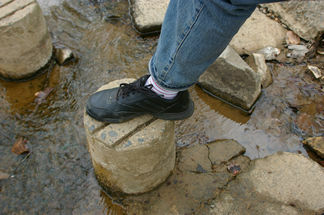 Large stone (boulder) crossings provide an adequate crossing for most adults. They may not be suitable for young children, some pets, or older adults. 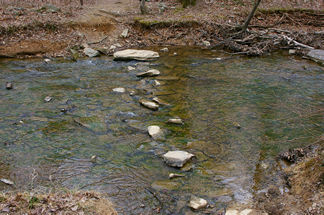 There are 2 such crossings on the CCT across Difficult Run. 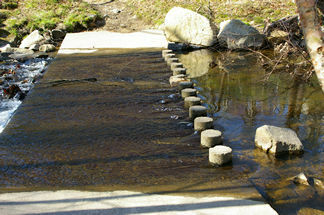 Fairfax County appears to be unique among local jurisdictions in creating column stream crossings. 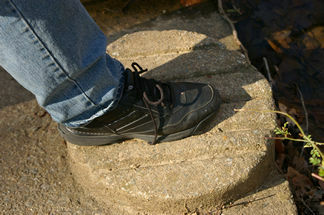 These are easily utilized by younger physically able people but are challenging to people with a less than excellent sense of balance. Large diameter columns covering a relatively short distance are rated C.
Fallen trees, defective Walk lights, and other problems on the trail. Report defective traffic lights or Walk lights to VDOT (703-383-2600). What follows are key maps along with some detailed trail maps and photographs of each section of the CCT. Several alternate routes are provided that are not part of the official route. The complete trail information is now available on this site. Please contact me (click on Comments below) should any key information change from that published here. Enjoy.